What is it about the latest and greatest computers that so mesmerizes us? The sudden proliferation of computer equipment, home theater components, and cell phones has turned us into a culture of modern magpies, constantly questing after the next bright and shiny object - a relentless drive for improvement that leads to MacBooks being improved in the matter of months and the recent revelation that Leopard "requires" an 867 MHz G4 processor to operate. Not to mention the iPhone's $200 price rollback. The computer industry is not the only enterprise to utilize the "planned obsolescence" business model, but sometimes it's necessary for a self-selected curmudgeon to remind us that the technologies of the past are still valid today. 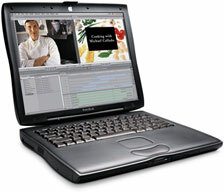 The Apple PowerBook G3 2000 (FireWire) was the culmination of Apple's PowerBook models. The WallStreet, Lombard, and Pismo ended Apple's use of the curve and the color black in it's design of notebook computers. Ever since the Pismo, the chiclet white or brushed silver (titanium or aluminum) rectangle rules the design department in Cupertino. The Pismo has a feminine quality that is missing from my wife's new MacBook. It seems to flow beneath your hands. As for the keyboard, the touch and feel of the Pismo's keys is extraordinary. It has the best feel of any keyboard I have ever used in my 20 years of using computers. Typing is effortless. It is also the last Apple laptop to feature expansion bays and interchangeable modules. You can configure the Pismo in a number of different ways. If you're not going to be near an AC outlet for most of the day, load the Pismo up with two batteries and cruise without a cord. Need a DVD burner? Not only are they available, but you can actually buy a Blu-ray drive for it. (Since the Blu-ray drive lists close to one large [$1,000], you have to be little committed or committable to put one in a seven-year-old Apple). Need two hard drives? If you have a spare 2.5" inch hard drive, a kit is available, and you have a spare drive to that fits the right expansion bay. A 3.5" inch floppy drive and a Zip drive are also available. It has got to be the Swiss Army knife of Apple notebooks. This PowerBook G3 has an external monitor connection as well as S-video output on the back. It can be used to play DVDs on a television or monitor and also has a built-in jack for headphones, along with a microphone input. It has two USB 1.1 jacks and two FireWire 400 ports. FireWire means that it can support Mac OS X 10.4 "Tiger" (how many seven-year-old PC laptops can run Vista?). FireWire also means it can be used in Target Disk Mode as well as utilize Tiger's Migration Assistant. I luuuve FireWire. Wireless? The Pismo carries an AirPort Card. Worried that new standards will leave the Pismo technically delayed? The Pismo has a PCMCIA card slot. Let me repeat that: The Pismo has a PCMCIA card slot. Big deal you say? 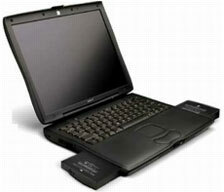 Any technology on a PCMCIA card now or in the future will be available to the Pismo user. Need more USB or FireWire ports? You got 'em through the PCMCIA slot. An adapter will allow you to take your camera's media cards and download your images to iPhoto. The adapter will also let you use the new multi-gigabyte Compact Flash cards for extra memory. But wait, you say. That G3 processor won't cut it. Mac OS X 10.5 "Leopard" - it won't run the next upgrade to OS X! You will be left behind when the Steve Jobs-driven Apple express pushes on into the future. You have maxed out that antique Pismo, and you will soon start to see the spinning beach ball of death any time you have to run anything remotely complex. You will have to use "Force Quit"! A lot! I only have 384 MB of RAM. I can (and probably will) load it up with the full gigabyte that is possible on the Pismo. There is also a G4 processor upgrade available. As far as the cost of taking apart the old girl, this has got to be one of the easiest laptops to work on. Take it from a man who has removed a hard drive from a iBook G3 Clamshell. Once you pop off the keyboard, everything is right there for you to work on. Being "stuck" with Tiger as my operating system is not a death knell. Tiger is easy to network, very stable and robust. So don't cry for me, Cupertino. I partitioned the hard drive, and the Pismo boots up in OS 9. Try that with your MacBook.